If you are managing project plan on MS Project Server environment, you have the option to send the resource assignments to team members and request the task progress from them. You have to use the Collaborate feature to do this activity. You begin by collaborating or publishing, all the assignments to all your resources. After the initial transmittal, you'll only need to publish new and changed assignments as you update the tasks in your project plan. Use this method when you are in the project initiation phase. 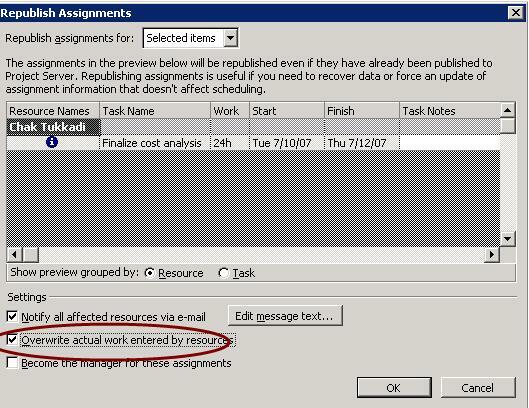 This method will update your project information on Project Web Access, without publishing assignments to team members. You can use this option when your project plan is in initiation stage and undergoing frequent changes. Use this method when you want to publish all the assignments and project information to PWA and team members. You begin by publishing by this option, which allows sending all the assignments to all your resources. Most of the time, you may be using this option during execution of your project. Use this method when you make day-to-day changes to your assignments or add new assignments. This method assumes that the assignments are either new and do not have historical actual work. This option also allows for selecting which individual assignments to publish. Entire Project Sends tasks assignments to the team for all changed tasks. Current View Sends task assignment messages to the team for tasks that appear within the current filtered view of tasks. 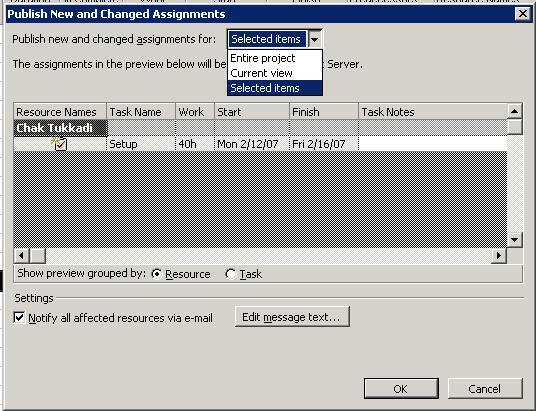 Selected Items This option allows us to first select the only required task assignments to publish and choose Collaborate -> Publish -> New and Changed Assignments; By doing this it Sends tasks assignment messages to the team for only those seleced tasks. You also have option under �Settings� to enable/disable email notification to the resources. By clicking �Edit Text�, you can send customized message about your updates to resources. 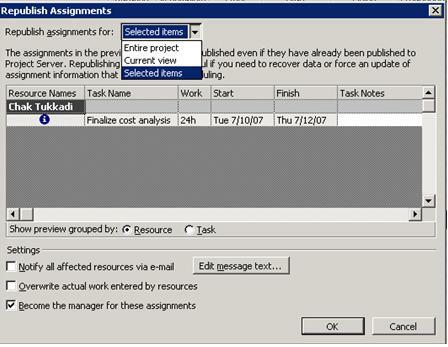 To publish an existing plan with historical actual work, use the republish assignments method with the �overwrite actual work� option. This option should be used to reset an assignment on resource timesheets or to publish historical actual work for the first time to initially populate resource timesheets with actual work. Please note that this option will replace all hours on the timesheet whether submitted or not. In other words you will overwrite all unaccepted updates and un-submitted hours on a resource�s timesheet with data from the plan. In practice do not use this option for day-to-day plan management. Use it to fix an error with an assignment or to initially synchronize existing actual work to resource timesheets. This option allows you to assign become the manager for tasks on resource timesheets. Please select the option "Become the manager for these assignments" under �Settings�. This option is suitable when new project manager responsible for previously published assignments.